This article will outline the simple, basic empirical facts that give evolutionists fits. They will run from these things as fast as they can and try to talk over everybody’s heads. They will try to sound impressive with their education and million dollar words. But they will make little, or no attempt to deal with these things. I will use humor and sarcasm against evolutionists. Some may get offended by that. Please bear with me, the heresies they teach are sending people to HELL. Don’t get upset because I make fun of them. The simple things herein will enable you to counter any evolutionist from your local teacher to Stephen Hawking or Stephen Gould. Charles Darwin and Carl Sagan already know. They are Creationists now! They donated their brains to science before they were done using them. Evolution falls flat on it’s face before it even starts. It requires NON-living things to naturally turn into living organisms all by themselves! This is SCIENTIFICALLY and NATURALLY IMPOSSIBLE. It has never been observed and there is no evidence whatsoever that it could ever happen, under any natural circumstances. Evolution is a Fairy Tale that Mother Goose wouldn’t believe! In plain language, to believe in evolution, that all life had a common ancestor, and that life formed from non-life, you MUST believe that YOU came from a ROCK! You gotta have ROCKS in your head to believe that! Must be STONED! Not only that, but you must believe that ALL LIFE made itself from a ROCK. That takes more faith than the Bible account could ever require. Only a gullible religious FANATIC could possibly swallow that! If it could ever happen, it would be SUPER-natural. That would verify Genesis 1:1 In the beginning God created the heaven and the earth! Evolution says that life arose from non-life, naturally, which is an oxymoron! It CAN’T happen naturally. There are really only two possibilities. Life arose naturally and created itself, or life was created Super-naturally. The only other possibilities are believed by people in rubber rooms who wear their sleeves tied behind their back. One is that we are not here, we only think we are. The other is that there was no origin, we have always been here. Both of those ideas are more bird-brained than a Cuckoo clock! If “life” could ever be created in a laboratory (no one has come close), all it would prove is that intelligent beings, working in a controlled environment, manipulated and experimented until they CREATED life! It would vindicate Genesis 1:1 In the beginning God created the heaven and the earth! Evolution says that the life arose by ITSELF, not with the help of a Creator. Do not let someone fool you with the misnamed “Micro-evolution” vs. “Macro-evolution” farce. What they call micro-evolution is not evolution at all. It is genetic variation and adaptation. It does happen naturally, has been observed, and can be replicated. The ability is already contained in the genes of the organism, and is limited by those genes. Anybody who tries to confuse the two got into the gene pool while the lifeguard wasn’t watching . Evolution (macro) says that one kind of animal TURNS INTO ANOTHER kind. It is the Fairy Tale of “The Frog Prince”, except instead of a kiss turning the frog into a Prince, it takes “millions of years”, instead. The “kiss” version is more scientific and believable! This has NEVER been observed, cannot be repeated, has absolutely NO empirical evidence, and is no more scientific than the Sunday Funnies. It is more comical than a Three Stooges film festival. Evolution says that a mouse becomes a moose, or a goose becomes a moose, a birch becomes a perch, a horsefly becomes a horse, and a frog becomes a Prince. Yes, it is a fairy tale too unbelievable for the brothers Grimm to include. The term “missing link” is an incredible underestimation, the whole CHAIN is missing! There are NO links they are ALL missing. There should be numerous transitional life forms between every species (thousands if not millions of different ones), but there is NOT even ONE indisputable link! Some evolutionists will try to claim one or two are, but they are highly suspect. All that have been proposed so far (Archaeopteryx, the horse series, Lucy, et al) have been thoroughly discredited. The straw that evolutionists will grasp is to claim that the links must be out there somewhere, we just haven’t found them yet. This shows the utter lack of intellectual honesty they exhibit. Evolutionists have been searching diligently for nearly 140 years since Darwin’s Fables was published. If they can’t uncover even ONE missing link in a century and a half, why should we believe anything they spew out? No evidence in 140 years, and that’s supposed to masquerade for ‘science’? Darwin was at least honest enough to say that the fossil record should bear the missing links IF his theory was true. The fossil record has failed miserably to show evolution. when it comes to empirical evidence, evolution is “without form and void”. Not only are there no new links discovered in the past 140 years, but there are even LESS “disputable” ones, as those formerly offered have been proven false. Supposedly, a theory that cannot be visibly substantiated can be verifiable or falsifiable by predictions it should be able to make. The predictions of evolution would be that the fossil record would show all kinds of transitional forms, since creatures allegedly change from one into another. The predictions of the Genesis Creation model would be that the fossil record would show all creatures fully formed, with no fractional transitions. 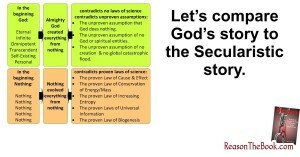 The Creation scenario is exactly what 140 years of the best efforts of evolutionists purposefully trying to document their own foolishness have uncovered in the fossil record. Evolution is unable to make predictions worthy of a fortune cookie! The biggest gaps in the theory come at the beginning. We have one celled creatures. The next most “simple” creatures contain thousands of cells. Where are the two-celled transitions? How about the four-celled links? Anybody for eight? Sixteen? 32, 64, …hut! ? They have been missing longer than Amelia Earhart. Then comes the gap between soft creatures and invertebrates. Invertebrates have no backbone, so they instead have a shell like a lobster. How could soft tissue evolve into a lobster shell with no transitional phases on the way? Houdini could not pull that one off. How about invertebrate to vertebrates (creatures with a backbone)? The shell suddenly folded up, stuffed itself inside the creature, and began working as a complicated spine with no in-between stages? No, actually the theory is what suddenly “folded up”! There are no transitions between ANY of the species. But if there could be, they would be a PROBLEM, not the solution. How could legs evolve into wings (or scales into feathers, etc.) without first being incomplete as EITHER? That would make the evolving creature highly susceptible to being caught by predators, and being unable to catch food itself, thereby becoming extinct. If someone espousing evolution had any less sense, he’d have to be watered twice a week. Think about this, how did sea life supposedly evolve up into mammals, and then the whales decided to go back into the water? Are whales backsliders? Mammals (which whales are) give birth HEAD-first (except, of course, partial-birth aborted humans, which are turned backwards on purpose, so their brains can be sucked out before their head is out of the womb). If whales gave birth like mammals should, we wouldn’t worry about having to “save the baby whales”, they’d all drown! It takes too long for a whale to give birth. Wouldn’t you know, whales naturally give birth upside-down! Now how did evolution ‘know’ how to do that? Did it wait until all the babies drowned and then realize that they needed to give breach birth? Too late, they’d be as extinct as the theory of evolution! Add to this the irregularity of the fossils than do exist. Many of them are found in the wrong stratas, some are found upright through more than one strata. that would mean they took millions of years to be fossilized (if the supposed ages are accurate, which they’re not, which is another dagger into evolution). They would have decayed in that time. The Grand Canyon, for example, is missing nearly 200 million years of fossil layers. If you give an evolutionist a penny for his thoughts, you’d get back change. The first two laws of Thermodynamics render evolution as impossible as a Cadillac evolving from an old Datsun, after an accident. They are LAWS, provable, demonstrable, testable, repeatable, empirical, scientific LAWS, not some wild dream like evolution. The 1st Law is the law of conservation. It states that neither matter, nor energy, can be created or destroyed. One can be changed into the other, but it cannot be annihilated. Evolutionists just cannot get past the very first verse in the Bible. No matter how hard they try to avoid it, we keep coming back to Gen 1:1. If one can accept that “In the beginning GOD…”, the rest of the Bible comes easy. They cannot explain how the first thing came into existence out of nothing. Some call that first item, the “Cosmic Egg”. Well, how did it get there? Was it laid by a cosmic chicken? Evolutionists really cannot tell which came first between the chicken and the egg! The second law is the law of entropy. When changing form, some of the energy becomes unusable, and thus everything runs down, decays, ages, breaks-down, becomes random, etc. when left to itself. This proves that evolution is absurdly impossible because it claims that we have evolved progressively. According to true science, all things break down. We should be de-volving, if natural processes take their course, the opposite of what evolution says. Of course we do not become another kind of creature, but we do age and decay as required by the 2nd law. Evolution is in the unenviable position of having to assert that random mutations somehow reverse the tendency of destruction inherent in the 2nd law as well as the mutations themselves. This law also proves impossible that something has always existed. Nothing can exist infinitely, it would wear-out sooner or later. Evolutionists must have a time buying a used car and expecting it not to break-down in spite of the maintenance and fuel added to it. The argument that evolutionist will use is to claim that the laws of Thermodynamics only apply to a closed system, not to an open one. There are more holes in that claim than in Swiss cheese after a machine gun attack! 1) Thermodynamic laws have operated on every system ever observed, open or closed. It’s an open and shut case. They simply hope and pray that somewhere there is an open system that violates the law. It takes more faith than a religious zealot to believe that in the face of the fact that it’s never been observed. 2) The universe is a closed system. An open system has an outside source feeding it energy. Of course, that means the outside source would undergo entropy. If there is something outside the universe feeding it, it is something beyond what is natural. It would be something SUPER-natural. Here we go again, right back to Genesis 1:1 “In the beginning God created the heaven and the earth.” The main idea of evolution is that the universe got here with NO outside help. They cannot explain how the FIRST thing got here, without God. 3) We are an example of an open system. We get our energy (fuel) from food and the sun. Nonetheless, we still age and DIE. Obviously the 2nd law still works in an open system. If aging and death are the evolutionist’s idea of victory over entropy, then they can expect a huge rebate from this taxing of their brains. 4) Growth is not an example of improvement or defeating entropy. Everything needed for the entire life of an organism is present in the genes. Growth is not necessarily an improvement. It requires outside fuel, thus the provider undergoes entropy. As something grows it needs more and bigger organs to accomplish less than the original single-celled organism! Imagine how complex that original zygote must have been. Growth still doesn’t explain how one kind of creature can change into another, which is what evolution requires. 6) Evolutionists believe that the very same processes that have been observed only to cause decay, death, and destruction caused NOTHING to create something, and the something to make itself come alive and then to evolve into more complex creatures culminating with man. What great faith! 7) An open system alone would not be enough to form life, even if it could defeat entropy. Also needed would be an adequate supply of energy, a conversion system to make the supply of raw energy constructive, and a control system to direct and regulate the conversion. All must exist simultaneously. 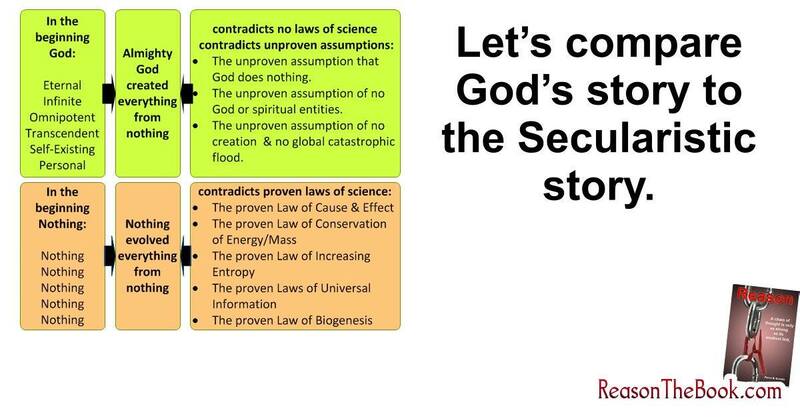 None of these conditions are inherent in the origin of the universe. It looks like the theory of evolution is suffering from a severe case of entropy. The first question that must be asked is, “What banged?” How did the “Cosmic Egg”, or “Hot Dot”, (or whatever the going theory proposes) come into existence? Where did the energy come from to make it bang? The Big Popgun theorizes that the egg/dot spun rapidly to form the energy to be put into motion. But, what made it spin? How did it get hot? Do they really expect sane people to believe that all of the matter in the universe was compacted into something the size of an egg or a dot! Once again, evolutionists can’t get beyond the first verse in the Bible. There is one fatal flaw in the Big Bang bunk. The Law of the Conservation of Angular Momentum specifies that if a rotating object breaks up, the pieces will continue spinning in the same direction until acted upon by an outside force. Of course, we are talking about the origin of matter and energy, there WAS no outside force to interfere with the motion, except “In the beginning God…”! The problem is that two planets (Venus and Uranus), and several moons spin backwards! Some of the moons even rotate north/south instead of east/west. Some are even revolving backwards around their planet! The Angular Momentum is yet another empirical scientific LAW that must be broken for evolution to be true. If evolution keeps on being such a lawbreaker, pretty soon it will have to deal with the Lawgiver! The Big Bang is backwards! As a matter of fact, in the Bible account, that’s not how the world began, that’s how it will end! One more simple fact that evolutionists ignore is the oxygen dilemma. Evolutionists know that if oxygen was present when their theory of origins was taking place, that organic molecules would be destroyed before they could be made. Thus, they pretend like there was no oxygen in the early earth model. The problem is, with no oxygen (which would also mean no Ozone which is oxygen with an extra atom per molecule), there’d be nothing to filter the earth from harmful radiation from the sun. This includes dangerous ultra-violet rays, gamma rays, infra-red light, and others. They, especially the UV, are fatal to a forming life. UV light destroys amino acids for one. Thus, with, or without, oxygen, life couldn’t have naturally arisen. One more time, that puts the beginning of life in the SUPER-natural realm, back to Genesis 1:1 “In the beginning God created the heaven and the earth.” Ho, hum, the evolutionists still can’t get past the very first verse in the Bible.